This dissertation investigates A’-dependencies in Standard German, Zurich German and Dutch where the dislocated constituent is indirectly, i.e. not transformationally, related to the position where it is interpreted. The analysis is carried out within the Principles & Parameters framework. The first two chapters address relative clauses. On the basis of a detailed examination of reconstruction, it is argued that German restrictive relatives are best handled in terms of the Matching Analysis. Chapter three deals with an alternative to long-distance relativization in German and Dutch where the relative pronoun is governed by the preposition von/van ‘of’ and a resumptive pronoun appears instead of a gap in the putative extraction site. The construction, which I term Resumptive Prolepsis, has paradoxical properties: While the external head is interpreted inside the complement clause in the position of the resumptive, there is clear evidence that the complement clause is a barrier for extraction. The paradox is resolved by postulating an indirect A’-dependency with short A’-movement in the matrix clause, operator movement in the complement clause and an ellipsis operation that links the two chains. The last chapter analyzes relative clauses in Zurich German. 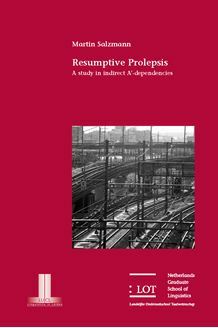 While local relativization is shown to be largely parallel to Standard German (with the exception of resumptives in certain positions), long-distance relativization is reanalyzed in terms of Resumptive Prolepsis. This study is of relevance to anyone interested in the syntax of relative clauses, reconstruction, resumption or in the study of the syntax of Standard German, Zurich German and Dutch.